This research has been carried out to transmit a multidisciplinary knowledge of esthetics in society and in the field of science (psychology, sociology, philosophy, medicine, art, ethics). This knowledge is necessary to ensure that esthetic doctors who deal with esthetic medicine may, through their intervention - which is not only analytical, but also creative - respecting human nature, people's esthetic expectations and the rules of social ethics. This is the only way we can best respond to the overall concept referred to as the human dimension. This may be carried out in different ways and contexts that are current and are an expression of the age we are living in. Coronal rehabilitation of endodontically treated posterior teeth is still a controversial issue. Although the classical crown supported by radicular metal posts remains widely spread in dentistry, its invasiveness has been largely criticized. New materials and therapeutic options based entirely on adhesion are nowadays available. They allow performing a more conservative, faster and less expensive dental treatment. 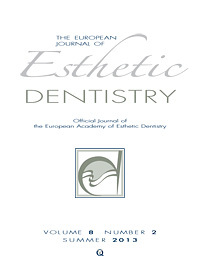 All clinical cases presented in this paper are solved by using these modern techniques, from direct composite restorations to indirect endocrowns. Enamel white spot lesions are frequent and can impact patients' quality of life. The most conservative treatment in such cases is microabrasion, a technique that presents some drawbacks. The proposed strategy is not based on the elimination of dysplastic enamel, but on masking the lesion by infiltrating the porous subsurface enamel with a hydrophobic resin that has a refraction index closer to that of sound enamel, after permeating the non-porous surface enamel through hydrochloric acid erosion. Erosion-infiltration approaches have been proposed to treat initial caries, but this report suggests extending it to two novel indications: fluorosis and traumatic hypo-mineralization lesions. Four cases were treated by erosion infiltration following the original protocol. They were followed up clinically at several intervals during a period of 19 months of clinical service. The clinical results, although not perfect, satisfied the patients entirely. Erosioninfiltration could be a promising alternative for minimally invasive treatment in similar situations. Mete, Jitendra J. / Dange, Shankar P. / Khalikar, Arun N. / Vaidya, Smita P.
Background: As visual shade matching is subject to light source variables, this study was conducted to compare shade matching performance of dental students under two lighting conditions, ie, natural daylight and a commercially available daylight lamp. Materials and methods: Two sets of porcelain discs were prepared. The first set consisted of eight porcelain discs of shades A2, A3, A3.5, B2, B3, C2, C3, and D3 of the Vitapan Classical Shade Guide system. The second set consisted of three porcelain discs of shade A2, B2, and C2, having exactly similar L*a*b* values to those of the corresponding shade discs in the first set. Forty dental students were asked to find the closest match for the shades A2, B2, and C2 in the second set from the first set under natural daylight and daylight lamp conditions. The average ΔE between the presented and selected shade was calculated for each participant under the two lighting conditions. The significance was statistically assessed using a paired t test. Results: The average ΔE between presented and selected shade for individual participants under natural daylight ranged from 0 to 4.84, with a mean of 2.24, while those under daylight lamp conditions ranged from 0 to 3.68, with a mean of 1.14. The difference was statistically significant, with P < 0.0001. Conclusion: Daylight lamp conditions significantly improved the shade matching performance of dental students. Caneppele, Taciana M. F. / Borges, Alessandra B. / Torres, Carlos R. G.
The objective of this study was to evaluate the color, translucency and fluorescence of bovine enamel and dentin submitted to different bleaching modalities. Pairs of enamel and dentin discs (3 mm in diameter) were obtained from 150 bovine teeth. In 75 of the pairs, one specimen had the enamel removed (Dentin Group). The dentin was removed from one specimen of the remaining 75 pairs (Enamel Group) and the other specimen was left unaltered (Enamel + Dentin). The evaluation of color, translucency and fluorescence was performed with a spectrophotometer using the CIE L* a* b*. Each group was subdivided into three subgroups: Control, composed of specimens that were not bleached, and two experimental subgroups, bleached with either 10% carbamide peroxide (CP10%) or 35% hydrogen peroxide (HP35%). The CP10% bleaching gel was applied 2 h/day for 14 days. The HP35% bleaching agent was applied using two applications of 30 min each, with a one week interval between each application. When not being bleached, the specimens were immersed in artificial saliva. The color, translucency and fluorescence ratings were assessed using spectrophotometry 7 days after the treatment. Regarding color, significant differences were found between bleaching techniques in the groups Enamel and Enamel + Dentin, with a higher color difference for HP35%. Bleaching did not change the translucency of the dental tissues. There were significant differences for fluorescence for the HP35% subgroups of Dentin and Enamel + Dentin, and for the CP10% subgroup of Enamel. Dental bleaching changed the color and fluorescence of the dental tissues, however translucency was not affected. Purpose: To evaluate translucency, fluorescence and opalescence stabilities of direct and indirect composite resins after aging. Materials and Methods: One direct (16 shades) and two indirect composite resins (16 and 26 shades) were investigated. Resins were filled in a mold (1 mm thick) and light cured; post-curings were performed for indirect resins. Color was measured before and after 5,000 cycles of thermocycling on a reflection spectrophotometer in reflectance and transmittance modes to calculate parameters for translucency (TP), fluorescence (FL) and opalescence (OP). Differences in the changes of TP, FL and OP after aging by the type of resin were determined by t test, and those were also determined by one-way ANOVA with the factor of the brand or the shade group (P < 0.05). Results: Changes in TP, FL and OP were -1.2 to 0.7, -0.2 to 0.4 and -0.6 to 1.3, respectively, for direct resins; and were -2.0 to 1.8, -0.9 to 0.4 and -2.9 to 3.7, respectively, for indirect resins. Changes in TP were not significantly different by the type of resin, but those in FL and OP were different (P = 0.05). Changes in optical parameters were influenced by the brand or the shade group of the resins (P < 0.05). Conclusion: Stabilities in optical properties of resins varied depending on type, brand or shade group. Aging significantly affected fluorescence and opalescence, but not translucency, of indirect resins compared to those of direct resins. Purpose: To measure the influence of light activation, color pigments and extended application time on the in vitro bleaching efficacy of a hydrogen peroxide bleaching agent. Methods: Ninety-six 2.5 mm thick bovine enamel and dentin samples were selected for the study. Samples were stained in a tea solution for three days and then randomly divided into three groups. Bleaching was performed with a 35% hydrogen peroxide gel containing different color pigments. Red pigments were used in group one, black pigments were used in group two, and no pigments (transparent gel) in group three. In these three groups the bleaching agent was applied once every 15 min (4 x 15 min). Then each group was divided into subgroups: with or without light activation. In addition, a fourth group with red pigment was used to test the efficacy of an extended application time (2 x 30 min). All samples were measured with a spectrophotometer to determine the L*a* b* values before and after bleaching. The ΔE value was then calculated. Analysis of variance and Duncan post-hoc test were used to identify differences between groups at a preset a of 0.05. Results: When black and red pigments were used on enamel, light activation of the bleaching gel had a significant effect on the ΔE values. On dentin without light activation, transparent gel was significantly different from the red and black colored gel. There was no significant difference in the ΔE values between 4 applications of 15 min each and 2 applications of 30 min each. Conclusions: Within the limitations of this in vitro study, no difference in the bleaching effect could be observed between applying the product 2 times of 30 min each and applying the product 4 times of 15 min each. The effect of light activation on colored gel was limited to enamel surface. In restorative dentistry, the non-vital tooth and its restoration have been extensively studied from both its structural and esthetic aspects. The restoration of endodontically treated teeth has much in common with modern implantology: both must include multifaceted biological, biomechanical and esthetic considerations with a profound understanding of materials and techniques; both are technique sensitive and both require a multidisciplinary approach. And for both, two fundamental principles from team sports apply well: firstly, the weakest link determines the limits, and secondly, it is a very long way to the top, but a very short way to failure. Nevertheless, there is one major difference: if the tooth fails, there is the option of the implant, but if the implant fails, there is only another implant or nothing. The aim of this essay is to try to answer some clinically relevant conceptual questions and to give some clinical guidelines regarding the reconstructive aspects, based on scientific evidence and clinical expertise.